Hydrus is lightfast, transparent, fine art quality watercolor in a glass bottle. This liquid product delivers the same brilliance and permanency as traditional tube watercolors. Made from the finest artist pigments, Hydrus watercolors can be blended and intermixed while still maintaining the transparency and luminosity of the colors. Both 12-color sets come in trays that double as mixing palettes and bottle holders, with space for a water cup and 12 individual mixing wells. Hydrus watercolors may be used in technical, calligraphy, and fountain pens, and also in airbrushes. Set 3 — Set includes 12 glass bottles: Blue Aqua, Carmine, Chrome Yellow, Crimson Lake, Hansa Yellow Medium, Quinacridone Violet, Raw Sienna, Raw Umber, Red Oxide, Turquoise Blue, Ultramarine Red Violet, and Vermilion Hue. Available in 1 oz or ½ oz bottles. Set 2 — Set includes 12 glass bottles: Hansa Deep Yellow, Yellow Ochre, Permanent Red, Cobalt Blue, Indian Red, Viridan Green, Burnt Sienna, Alizarin Crimson, Sepia, Payne's Gray, Sap Green, and Burnt Umber. Available in 1 oz or ½ oz bottles. 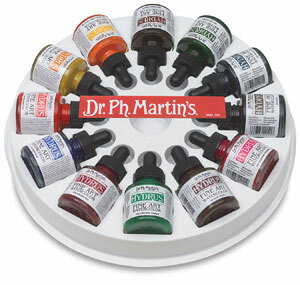 Set 1 — Set includes 12 glass bottles: Hansa Yellow Light, Gamboge, Brilliant Cadmium Red, Deep Red Rose, Quinacridone Magenta, Phthalo Green, Phthalo Blue, Ultramarine, Cobalt Violet, Venetian Brown, Carbon Black, and Titanium White. Available in 1 oz or ½ oz bottles.